OXFORD, Miss. 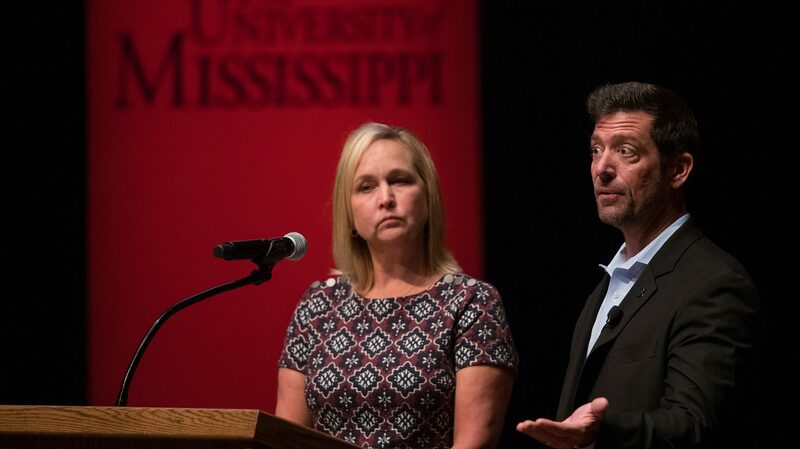 – Painful memories and brutal facts were revealed Tuesday (Oct. 9) at the University of Mississippif as the parents of Max Gruver and Tim Piazza detailed how their sons died from binge drinking during separate fraternity hazing incidents in 2017. 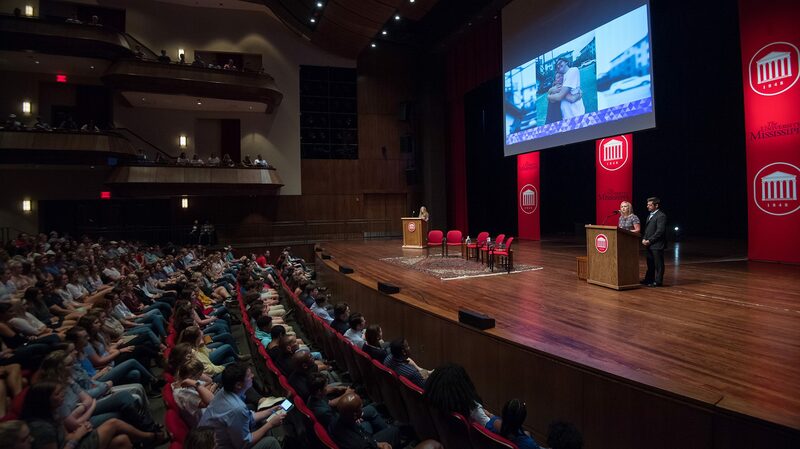 More than 1,000 people from the community filled the Gertrude C. Ford Center for the Performing Arts for “Family Matters: A Community Conversation on Hazing.” The audience listened intently as Steve and Rae Ann Gruver and Evelyn Piazza spoke frankly about the trauma surrounding the two tragic fatalities that were among four separate pledge deaths across the country last year. The trio also called upon student leaders to join campus administrators in effecting a “no-hazing” culture on campus. On Feb. 3, 2017, Piazza’s son, who attended Pennsylvania State University, was served 18 drinks in roughly an hour-and-a-half during a Beta Theta Pi fraternity pledge initiation called “The Gauntlet.” The 19-year-old fell several times, including down a flight of stairs, causing numerous traumatic injuries. Members didn’t get him medical attention until the next morning. He died Feb. 4, 2017. During an initiation called “Bible Study,” senior Phi Delta Theta fraternity members at Louisiana State University instructed Gruver, 18, and other pledges to chug 190-proof Diesel liquor. He died Sept. 14 with a blood-alcohol level of .496, more than six times the state’s legal driving limit. Steve Gruver shared how hazing is a misdemeanor in Mississippi punishable by a fine of up to $2,000 and six months in jail. In states where hazing is a felony, those convicted have permanent criminal records. Using video and photo stills, the Gruvers and Piazza shared pertinent information about the manners and types of hazing, number of campus hazing deaths nationally since 2005 and actions that can be taken to counter hazing. Arthur Doctor Jr., UM director of fraternal leadership and learning, and student Brittany Brown served as moderators for the event. Ann Weston Sistrunk, College Panhellenic president, gave a welcome; Randon Hill, National Pan-Hellenic Council president, introduced the presenters; and Bennett Wilfong, Interfraternity Council representative, gave closing words to those in attendance. “Hazing should have no place on our campus if we will all live by the words of the UM Creed,” Wilfong said. “Speaking up will not be easy, but it’s the right thing to do. Recruitment visits and assessments by National Interfraternity Council representatives. To report any concerning behavior, complete the Hazing Report Form at http://umatter.olemiss.edu/hazinginfo/.